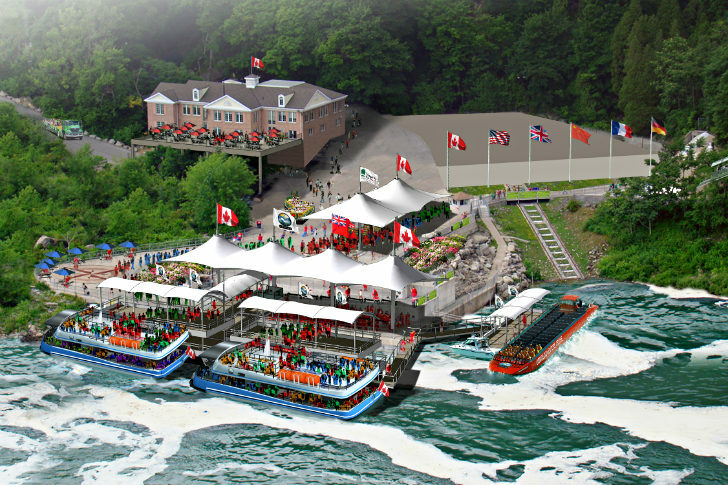 Niagara Falls will soon have a new landing and visitor center from which to hop on a cruise for an up close and wet view of the natural wonder. Heller Manus Architects & Hornblower just won a design competition to renovate the landing and entry site with new LEED certified facilities. The winning design creates an inviting entry and boarding area, a visitor center, and a private riverside event space. In addition, there will also be new boat touring vessels that will run cleaner and quieter than in the past. Hornblower, who operates tours to both Alcatraz & the Statue of Liberty, has recently been selected to operate the tours of the Niagara Falls Gorge. Working with Heller Manus Architects, who also designed the landings for Alcatraz & Battery Park, will design the landside facilities at the Niagara Falls Gorge. “Our success – following Alcatraz Landing in San Francisco and The Statue of Liberty in New York – demonstrates the value of design in the educational tour experience for the natural wonder of Niagara Falls,” said Clark Manus, FAIA, CEO of Heller Manus, Partner-in-Charge of the project, and 87th President of the AIA. The new facilities will create inviting entry and boarding areas, a visitor’s center, and a private riverside event space for Hornblower. 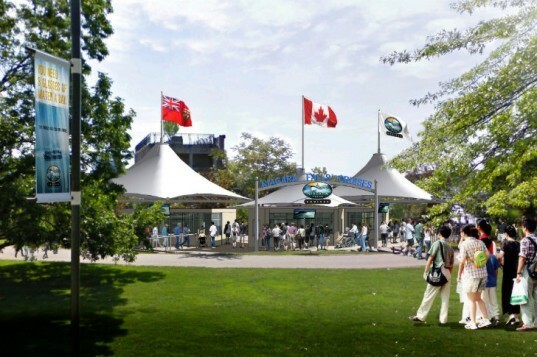 The entry pavilion will be covered with three fabric tents and provide shelter for those waiting for tickets, serving as a visual gateway. An existing brick building will be converted into the event space and house a cafe, interpretative displays, special events spaces, restrooms, lockers and storage space. A large exterior deck on the second level will provide visitors with views of the falls and be used as outdoor dining. As part of the project an abandoned funicular will be restored and used to shuttle visitors to and from the boat landing area. Heller Manus has completed the initial design and is currently working on the details, but we do know that they will seek LEED certification to respect the natural landscape of the area. Hornblower is designing new boat touring vessels that will run cleaner and quieter than any previous vessels in the Gorge. Is this on the Canadian or US side of Niagara Falls? Hornblower, who operates tours to both Alcatraz & the Statue of Liberty, has recently been selected to operate the tours of the Niagara Falls Gorge. Working with Heller Manus Architects, who also designed the landings for Alcatraz & Battery Park, will design the landside facilities at the Niagara Falls Gorge.